Walsall Community Physiotherapy provides assessment and treatment of musculoskeletal conditions involving manual, electro-therapeutic and exercise therapy alongside chronic management programmes to aid recovery of patients back to work and full function or to aid patients living with long term chronic conditions. We also provide exercise classes for shoulder, back, lower limb and osteoarthritis knee patients to continue their rehabilitation process. The Walsall Talking Therapies Service supports people with depression and anxiety symptoms. They can help people aged 17 and over who are registered with a Walsall GP. Please click here for more information and to self-refer to the service. You can now self-refer to Jo Harrison, Community Dietitian who is based at Willenhall Health Centre. She provides 1.1 support; monthly for up to 6 months, or longer if making progress. She has no medical or physical activity input. 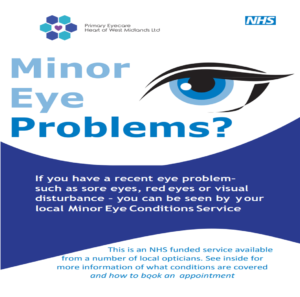 You can now self-refer to any of the following Opticians for minor eye conditions such as eye infection, or weeping eyes.